It is important for us to understand that in the years ahead of us a dictator from Europe will astound the world. We have a model of sorts to look at in the person of Adolf Hitler. During the early years of the Great Depression Hitler promised jobs, protection from the Communist threat, and a restoration of German pride. The German people, economically depressed and desperate for security, grabbed hold of his promises and elected him to national prominence. His twelve-year rule permanently scarred Germany, Europe and the world. He is a prototype of the end time dictator who is called “the beast,” the term denoting either a vicious political empire or its leader. This tyrant who will soon appear on the world stage, clothes himself in the mantle of greatness. His vanity will swell to delusional proportions; he demands absolute obedience of his subjects. The Bible describes the nature of this final European Beast dictator in Daniel 11:36-38. Daniel 11:36 says, “Then the king (the coming “Hitler”/dictator) shall do according to his own will; he shall exalt and magnify himself above every god, shall speak blasphemies against the God of gods, and shall prosper till the wrath has been accomplished; for what has been determined shall be done.” This man is also known as the King of the North depicted in Daniel 11:40. 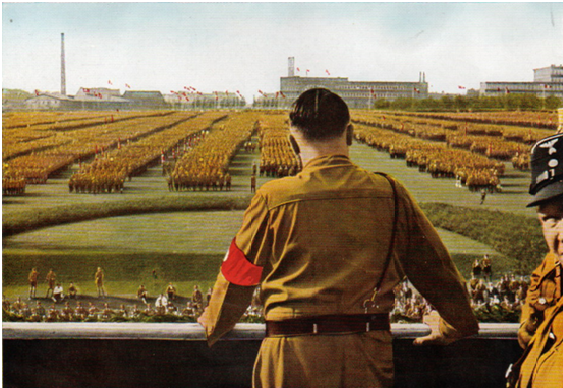 His megalomania is Hitler-like; he desires the obedience and worship of the people. In verse 37 of Daniel 11, we are told, “He shall regard neither the God of his fathers nor the desire of women, nor regard any god; for he shall exalt himself above them all.” This dictator will not be interested in religion personally, but other prophecies inform us that he will accept the backing of the great false church (Catholic Church) in order to advance his agenda. This great military-political leader (called “the Beast” in Revelation 13:7; Revelation 17:12-13; Revelation 19:19-20) will seek to dominate and control all nations. He will bear responsibility for warfare on a scale unseen in human history. His aggression will culminate in the armies of the world gathering at Armageddon (Revelation 16:14-16). From Armageddon millions of soldiers will then march 55 miles south to Jerusalem to fight against Jesus Christ himself. The war or battle against Christ is called “the battle of the great day of God Almighty.” Revelation 16:14. But where will the battle take place? The prophet Joel tells us that this cataclysmic battle will take place near Jerusalem. “For behold, in those days and at that time… I will also gather all nations, and bring them down to the Valley of Jehoshaphat; and I will enter into judgment with them there” (Joel 3:1–2). The valley of Jehoshaphat, also called the Kidron Valley, is located between Jerusalem and the Mount of Olives, and extends to the south of the city. The world’s armies will move southward from Megiddo (Armageddon) to fight Jesus Christ at Jerusalem. Millions of soldiers will die at the hands of Jesus Christ. Take note of the results of that battle: “For I will gather all the nations to battle against Jerusalem… Then the LORD will go forth and fight against those nations, as He fights in the day of battle. And in that day His feet will stand on the Mount of Olives” (Zechariah 14:2–4). Notice the hellish vengeance poured out on those rebellious armies of the world. “And this shall be the plague with which the LORD will strike all the people who fought against Jerusalem: Their flesh shall dissolve while they stand on their feet, their eyes shall dissolve in their sockets, and their tongues shall dissolve in their mouths” (v. 12). This charismatic, brutal European “Hitler-like” dictator will finally be destroyed by Jesus Christ. John writes: “Then the beast was captured, and with him the false prophet who worked signs in his presence, by which he deceived those who received the mark of the beast and those who worshiped his image. These two were cast alive into the lake of fire burning with brimstone. And the rest were killed with the sword which proceeded from the mouth of Him who sat on the horse. And all the birds were filled with their flesh” (Revelation 19:20–21). Negotiations with Iran regarding its controversial nuclear program have failed. It could not be more clear; Iran has no interest in complying with the international community. Tehran is progressing with the development and installation of new IR-2m centrifuges, which can enrich uranium up to five times faster than the current IR-1 centrifuges. Clearly America is not pleased. The U.S. has decided to flex its muscle and show Iran that it is ready to support Israel, Saudi Arabia and the United Arab Emirates, chief rivals to Iran in the region. The New York Times reported: The Defense Department is expected to finalize a $10 billion arms deal with Israel, Saudi Arabia and the United Arab Emirates this week that will provide missiles, warplanes and troop transports to help them counter any future threat from Iran. The U.S. arms deal provides an undesignated, number of KC-135 Stratotankers to Israel. These fueling planes will permit Israel to deploy more fighter aircraft in any strike against Iran. 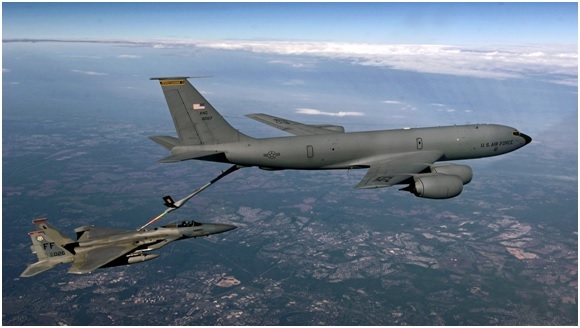 The KC-135 refueling planes would let Israel’s warplanes stay in the air longer, should a long-range mission — like a strike on Iran, take place later this fall. A single KC-135 could possibly support up to eight Israeli aircraft in a strike against Iranian targets. A mission into Iran by Israeli aircraft would mean traveling over 1400 miles to the targets—then the planes have to get back home. “Behold, the day of the Lord is coming . . . For I will gather all the nations to battle against Jerusalem . . . Then the Lord will go forth and fight against those nations . . . And in that day His feet will stand on the Mount of Olives, which faces Jerusalem on the east . . . ” (Zechariah 14:1-4). Only Jesus Christ can resolve the endless fighting and hatred that we see in the Middle East. But until that time of His return, that region of the world will only know suffering and war. The Fox video speculates that the older brother may have been trained overseas in terrorist skills. Many in the world seek the terrorists’ limelight with an attack on a very public, highly visual setting whether that location is the World Trade towers, or a famous event such as the Boston Marathon. Terrorists seek to magnify terror by gaining as much media attention as possible. This attention thrills the terrorist community and draws more evil people to the terrorist role. Practitioners of terrorism are greatly frustrated when they lose their ability to panic people or influence a government. If people live their lives in constant fear, if media obsesses about terrorists then the terrorists maintain their energy. The key is to practice awareness in our public lives without giving into fear and panic—something the terrorists seek to magnify. The identities of the suspects in the Boston Marathon bombing — Chechen brothers Dzhokhar Tsarnaev, 19, and Tamerlan Tsarnaev, 26; according to News sources, the two men are from Chechnya. The North Caucasus region of Russia faces constant instability, with violence occurring on a regular basis in places like Chechnya and Dagestan. Chechnya is a mountainous and mainly Muslim republic in southern Russia that has been the scene of revolts and brutal crackdowns by Moscow’s forces for the past 200 years. The overarching concern is that the jihadist threat may now shift to “agents” who live in Europe and America rather than trained overseas operatives sent to American and European cities. Terrorist attacks are bound to increase but may be smaller in their impact in terms of lives lost as compared with the 9/11 event. We do not know if the Chechen brothers have terrorist training, we will learn of that in the days ahead. Terrorists are motivated by hate and anger. Satan is an angry spirit who seeks to kill—a murderer from the beginning [John 8:44]. Tragically, there will be more acts of terror in this nation and in Europe. Religion: Catholic 34%, Protestant 34%, Muslim 3.7%, others 27% The state supports both the Catholic and Protestant churches, with each church making up about a third of the German population. 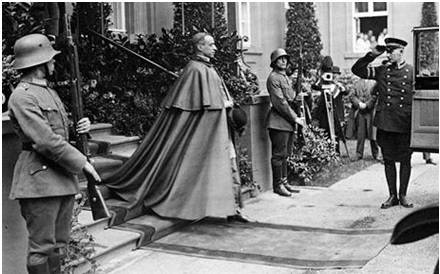 History: The Vatican’s secretary of state, Cardinal Eugenio Pacelli (the future Pope Pius XII), and Germany’s vice chancellor, Franz von Papen, formally signed a concordat between the Holy See and the German Reich on July 20, 1933. The Holy See’s concessions included the concordat’s requirement that clergy not engage in political activities and not hold political offices. Bishops were required to swear an oath of loyalty to the Reich and its legally constituted government. To this day Jews [especially in Israel] condemn the Vatican for turning a blind eye to the massacre of Jews during the 2nd World War. We believe a similar act of complicity between the Catholic Church and Germany will occur in the future under the approval of the European Beast dictator. Prophecy: Scripture shows that ten nations in Europe will surrender their sovereignty to a modern version of the Roman Empire (Revelation 17:12–18). This “beast” power will be endorsed by a false religious prophet –a Catholic leader (Daniel 7:24–25; Revelation 13:11–18). The leaders of this ” revived” beast power (which is also called “the king of the North) will persecute true Christians—Revelation 13:7. This power will punish (America, Britain and other nations of northwest European descent), and will launch military operations in the Middle East and against powers to the north and east on the Eurasian continent (see Daniel 11:40–45; Hosea 11:1–11). To summarize: The Bible reveals that Germany will again use religion to help forge a unified European power (Revelation 13; 17:1–7), much as was done under Charlemagne [800 AD] who was crowned European Emperor by the Pope Leo III. This future Church/State union will do great harm; God’s saints will be severely persecuted. This emerging superpower will become a global economic power (Revelation 18:2–3, 9–14). It will appear peaceful at first, but will be transformed into a devouring, war-making beast (Daniel 11:21; Revelation 13:2–3; Revelation 17:12–14). Daniel describes this end-time kingdom as a strong and ferocious beast with “iron teeth,” which Christ will conquer and punish at His return (Daniel 2:40–45; 7:7, 19–23). What we are seeing today is unique in history, never have so many nations, at the same time, given themselves over to the idea that the key to rescuing their economies lies in printing money and buying one another’s debt [bonds]. The world’s four biggest developed-market monetary authorities – the Bank of Japan [BOJ], the Fed [USA], the European Central Bank [ECB] and the Bank of England — are committed to returning their economies to health. Spurring growth can include printing money or to be more accurate increasing credit in its own bank account with the stroke of a computer key. Only a Central Bank can “increase” money, they do this electronically. If a Central Bank wants to increase money supply, it can buy government bonds—there are other ways. Many banks are involved in what is called Quantitative Easing. Quantitative Easing is when a Central Bank creates money electronically. In doing this they are increasing the bank reserves. The Central Bank uses these extra reserves to buy various securities, this may include government bonds and corporate bonds. Banks can sell assets [bonds] for cash—this increases the Bank’s cash reserves. The hope is that when the Bank has more “cash” it will be more willing to lend to customers. This lending to customers will then result in people having more money to buy homes, cars etc. At least this is the way it is suppose to work. The goal of Quantitative Easing is to increase bank lending, and this– it is hoped, will stimulate the consumer to spend more [as he gets loans, usually for business, from the bank]. But it doesn’t always work out as planned. The Central Banks of the world are playing a dangerous game. Quantitative Easing flirts with inflation, and once inflation gets going it is very hard to stop. Rampant inflation struck Germany’s Weimar Republic in the 1920s and most recently in the nation of Zimbabwe. It could happen to us. Inflation is a hidden tax on every American, European and Asian. The world financial crisis has led to the “printing of money”. Eventually we will reap what we sow. Do not be deceived: God is not mocked, for whatever one sows, that will he also reap. Galatians 6:7. Flooding the world economy with money, governments buying more and more debt, all of this will eventually end badly. The timing of the next massive global financial crisis is impossible to predict but it is coming. Collectively, the world’s Central Banks have pumped over $13 trillion into the financial system since 2007.